Federico Macheda (Italian pronunciation: [fedeˈriːko maˈkɛːda]; born 22 August 1991) is an Italian professional footballer who plays as a forward for Superleague Greece club Panathinaikos. Born in Rome, Macheda began his career with local club Lazio, but joined Manchester United when he turned 16 in 2007. He turned professional in 2008, before scoring on his first-team debut in April 2009. Macheda spent the next couple of years on the fringe of the United first-team, before twice going out on loan – first to Sampdoria in his native Italy in 2011, and then to Queens Park Rangers in 2012, the latter of which was curtailed by injury. He spent further spells on loan, at VfB Stuttgart, Doncaster Rovers and Birmingham City. Having failed to break into the Manchester United first team, Macheda was released at the end of his contract in June 2014, leaving him free to sign for Cardiff City. He spent two years there before being released, also having a short loan at Nottingham Forest, and then spent 18 months with Novara of Serie B.
Macheda is a former Italian youth international, having made appearances for the national under-16, under-17, under-19 and under-21 teams. When he made his under-21 debut in August 2009 in a friendly against Russia, he was the youngest player to do so at the age of 17 years, 355 days. He scored his first goals for the team just over a year later in a match against Turkey. Macheda was born in Rome, Lazio. He began his football career with Lazio's youth team after being spotted at the local Atletico Prenestino club in Rome. However, due to Italian football regulations preventing under-18s from signing professional contracts, he was not permanently tied to the club, and shortly after his 16th birthday, he was signed by Manchester United of England, where regulations permit the signing of players aged 16 and over. Following his family's relocation to England, he officially joined the club as a trainee on 16 September 2007. Macheda went straight into the Manchester United Under-18 side, and scored the only goal of the game on his debut, a 1–0 away win over Barnsley on 15 September 2007. In his first season with the club, he finished as the Under-18s' top scorer with a total of 12 goals in 21 appearances, and also made his debut for the reserves: on 26 February 2008, when he came on as a 68th-minute substitute for Gerard Piqué in a 2–0 away defeat to Liverpool. On 12 May 2008, Macheda earned a Manchester Senior Cup winners' medal when he was named as an unused substitute for the 2–0 win over Bolton Wanderers in the final. Macheda signed his first professional contract with Manchester United on his 17th birthday in August 2008. In the 2008–09 season, he continued in the under-18 side, while also making a few appearances for the reserves. Towards the end of the season, Macheda enjoyed an extended run in the reserve team, scoring eight goals in eight games, including a hat-trick in a 3–3 draw with Newcastle United on 30 March 2009, and he was rewarded by being selected for the first team for the match against Aston Villa on 5 April 2009. With United 2–1 down heading into the final third of the game, manager Alex Ferguson substituted Macheda in for Nani just after the hour mark. After Cristiano Ronaldo equalised for United in the 80th minute, Macheda won the match with a turn to evade his marker followed by a curling effort from just inside the penalty area in the third minute of injury time. Macheda playing for Manchester United in a 2010 pre-season match against the MLS All-Stars. Macheda was named on the bench for United's next two games – first against Porto in the first leg of their Champions League quarter-final, and then against Sunderland in the league – making his second appearance for the club in the latter game. Just 46 seconds after taking to the field in place of Dimitar Berbatov, Macheda had the ball in the back of the net for the second time in his United career, deflecting a Michael Carrick shot past Craig Gordon in the Sunderland goal. With Alex Ferguson opting to rest his big-name players for the FA Cup semi-final against Everton on 19 April 2009, Macheda was handed his first start in a Manchester United shirt. However, for the first time in his United career, Macheda failed to score and was substituted for Dimitar Berbatov at the start of extra time. He started his first Premier League game in a 2–0 win over Middlesbrough on 2 May 2009; he was involved in the build-up to Park Ji-Sung's goal, but he failed to get on the scoresheet himself and was substituted ten minutes into the second half. At the end of his first season in the Manchester United first team, Macheda was named as the Jimmy Murphy Academy Player of the Year in recognition of his performances in the under-18s, the reserves and the first team. Macheda's 2009–10 season began with appearances in the third and fourth rounds of the League Cup, against Wolverhampton Wanderers and Barnsley respectively. He made his Champions League debut against CSKA Moscow on 3 November, followed by another appearance in the 1–0 defeat to Beşiktaş on 25 November, in which he forced a save from the goalkeeper in the last minute. He came on as a substitute for Dimitar Berbatov in the League Cup fifth round on 1 December, before signing a four-year contract the next day that would tie him to the club until June 2014. Towards the end of the year, Macheda suffered an injury that kept him out until 21 January, when he returned for a reserve match against Sunderland. However, he picked up another injury soon after, meaning that he missed out on the win over Aston Villa in the League Cup Final. He made his first Premier League appearance of the season in the 4–0 win over Bolton on 27 March, replacing Ryan Giggs in the 84th minute. With Wayne Rooney suffering ankle ligament damage against Bayern Munich in the Champions League, Macheda was named on the bench for United's top-of-the-table clash at home to Chelsea on 3 April. With United 1–0 down, Macheda came on for Paul Scholes in the 72nd minute; Chelsea scored a second goal in the 79th minute, before Macheda scored a consolation goal for the home side two minutes later, although there was a suspicion of handball as he turned the ball into the net. On 28 July 2010, Macheda scored his first goals of United's pre-season tour of North America as he netted twice in the 2010 MLS All-Star Game. The first came after just 21 seconds as he capitalised on a poor back-pass and the second came in the 13th minute with a header from a Nani corner kick. On 13 November 2010, Macheda scored his first goal of the season, netting United's first goal in a 2–2 away draw against Aston Villa. On 8 January 2011, Sampdoria confirmed Macheda had joined on loan until the end of the season. He was seen as a temporary replacement for Antonio Cassano who had left to join Milan. Macheda made his debut for Sampdoria on 9 January in a 2–1 home victory over Roma. On 19 January, Macheda scored his first and only Sampdoria goal on his first start for the club, as he opened the scoring in their Coppa Italia tie against Udinese. Sampdoria won 5–4 in a penalty shootout as the game had ended 2–2 after extra-time. Unfortunately, the club's poor performances led to their relegation to Serie B. Following their relegation, Macheda's agent said he could make a return to Sampdoria, but the player himself ruled out a return to Italy in the 2011–12 season and stated that he would remain at Manchester United. Macheda returned to Manchester United at the end of the season having made 14 appearances in Sampdoria's unsuccessful battle against relegation. Upon his return, he expressed his wish to continue his football education in England, saying "For a youngster, England is a better place to play." Macheda then scored two goals against the New England Revolution in the first game of Manchester United's 2011 tour of the United States. Macheda played his first game of the 2011–12 season in Manchester United's 3–0 win over Leeds United in the League Cup. He scored another goal, from the penalty spot, in United's 1–2 loss to Crystal Palace in the quarter-final of the 2011–12 Football League Cup. On 2 January 2012, Macheda was loaned out to fellow Premier League club Queens Park Rangers for the rest of the season. On the same day, he played his first game, coming on as a substitute for Heiðar Helguson in the 80th minute in the 2–1 loss to Norwich City at home. On 28 March 2012, Macheda returned to Manchester United for treatment after an ankle injury which ended his season. Macheda returned to Manchester United for pre-season training and was chosen to take part in the club's tour of South Africa. He scored the only goal in a 1–0 victory over AmaZulu at the start of the tour. Since then, he did not feature in any league games for United. On 24 January 2013, Macheda was loaned to VfB Stuttgart until the end of the season. The German club's sporting director Fredi Bobic announced that Manchester United promised Stuttgart an option of purchase, but they did not use any such option. On 16 September 2013, Macheda joined Doncaster Rovers on a one-month loan. He made his debut the following day in Doncaster Rovers away loss to Watford, coming on as a substitute for David Cotterill in the 58th minute. He scored his first goals for Doncaster when he struck twice against Nottingham Forest on 21 September 2013 in a 2–2 draw. The following week, he scored again scoring the only goal in the derby against local rivals Sheffield Wednesday; this made it three goals in as many appearances for his new club. On 8 October 2013, Macheda returned to Manchester United after a hamstring injury. After recovering from his injury, Macheda returned to Doncaster for a separate loan spell, lasting until the end of December 2013. On 31 January 2014, Macheda became the third Manchester United youngster to join Championship club Birmingham City on loan until the end of the 2013–14 season, after Tyler Blackett and Tom Thorpe. He replaced Lee Novak after an hour of the following day's match, at home to Derby County, and scored in stoppage time after Emyr Huws' shot had hit the post, to make the final score 3–3. At home to Burnley on 12 March, Macheda replaced Olly Lee after 60 minutes with Birmingham 1–0 down. He equalised four minutes later, and his 94th-minute second gave his team a 3–3 draw, despite opposition claims that he had used his arm to control the ball. He finished the season as Birmingham's top league goalscorer, with ten goals from just ten starts and eight appearances as a substitute. After being released from Manchester United, Macheda signed for newly relegated Championship club Cardiff City on a free transfer on 27 May 2014. He was signed by Ole Gunnar Solskjær, his former manager at United's reserves. He made his Cardiff debut in the second round of the League Cup away to Port Vale on 26 August 2014, and marked the occasion with his first two competitive goals for the club, as they progressed to the third round with a 3–2 victory. Macheda received his first red card for Cardiff on 14 March 2015 against Brentford for a second yellow after scoring an equaliser earlier in the match. Having made no league starts and very few substitute appearances in 2015–16, Macheda joined fellow Championship club Nottingham Forest on loan until the end of the season; the move was completed on 15 March, and he went straight into the starting eleven for that night's game, a 1–1 draw away to Hull City. Upon his return, he was left out of the pre-season tour of Germany and was placed on the transfer list by new manager Paul Trollope. On 30 August 2016, Macheda's contract was cancelled by mutual consent. On 14 December 2016, he joined Serie B side Novara Calcio on an 18-month contract; he was awarded the club's number 10 shirt. On 25 February 2017, Macheda scored his first goal for Novara in Serie B in a 2–1 home win over Spezia; this was his first Italian league goal, and the first goal he had managed for an Italian team since 2011, when he scored for Sampdoria in the Coppa Italia. On 17 April, he scored his first brace in six years in a 3–2 away win over Frosinone. Macheda left the club when his contract expired at the end of the 2017–18 season. Macheda signed a three-year contract with Superleague Greece club Panathinaikos in September 2018. 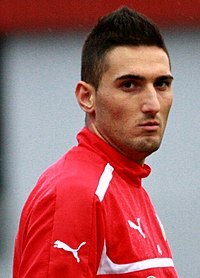 Ahead of the 2009 UEFA European Under-21 Championship, Macheda was named in Italy's preliminary 40-man squad; however, he was ultimately not named in the final 23-man squad. On 12 August 2009, Macheda made his debut for the Italy U21s in a friendly against Russia. Macheda scored his first goals for the U21s as he netted twice in a 2–1 victory over Turkey on 17 November 2010. Macheda scored the only goal in a 1–0 win over England, netting a late penalty on 8 February 2011. The following game saw Macheda score Italy's third in a 3–1 win over Sweden on 24 March. Nicknamed Kiko, Macheda is a quick and versatile forward, who is capable of playing in a central role as a main striker, or in more of a supporting role as a second striker or attacking midfielder. Although naturally right-footed, he possesses an accurate and powerful shot with both feet, and is known in particular for his clinical finishing, intelligent movement, and ability to curl shots on goal from outside the area. He has been described as a "modern striker", as his technical skills, ability to read the game, and positional sense in the box, combined with his tall, large and strong physique, allow him to hold up the ball with his back to goal, retain possession under pressure, and create space for himself even in limited spaces and when being heavily marked by more physical opponents. Regarded as one of Italy's most promising prospects in his youth, in 2010 Don Balón included him in their list of the 100 best young players born after 1989; in recent seasons, however, he has often struggled to live up to his potential. Early in the morning of 12 July 2009, Macheda's home in Sale, Greater Manchester was targeted by robbers, who stole cash and jewellery. A friend of his received a minor head wound during the robbery. While on loan at Queens Park Rangers in 2012, Macheda was involved in two cases of misconduct on Twitter. ^ a b c d Hugman, Barry J., ed. (2010). The PFA Footballers' Who's Who 2010–11. Edinburgh: Mainstream Publishing. p. 268. ISBN 978-1-84596-601-0. ^ "Federico Macheda". Panathinaikos F.C. Retrieved 4 October 2018. ^ "Record debut for Lorenzo Crisetig". Inter Milan. 12 August 2010. Retrieved 4 September 2016. ^ Fletcher, Damien (7 April 2009). "Exclusive: Federico Macheda's father reveals how the Manchester United prodigy saved his family from poverty". Daily Mirror. London. Archived from the original on 8 April 2009. Retrieved 8 April 2009. ^ Hibbs, Ben (15 September 2007). "U18s: Barnsley 0 United 1". Manchester United F.C. Retrieved 16 March 2016. ^ Bartram, Steve (26 February 2008). "Reserves: L'pool 2 United 0". Manchester United F.C. p. 2. Retrieved 16 March 2016. ^ Bartram, Steve (12 May 2008). "Reserves win Senior Cup". Manchester United F.C. p. 2. Retrieved 16 March 2016. ^ Hassan, Nabil (6 April 2009). "Who is Federico Macheda?". BBC Sport. Retrieved 7 April 2009. ^ Bartram, Steve (30 March 2009). "Reserves: Newcastle 3 Utd 3". Manchester United F.C. Retrieved 16 March 2016. ^ Hibbs, Ben; Thompson, Gemma (3 April 2009). "Striker concern for Reds". Manchester United F.C. Retrieved 6 April 2009. ^ Hughes, Ian (5 April 2009). "Man Utd 3–2 Aston Villa". BBC Sport. Retrieved 5 April 2009. ^ McNulty, Phil (7 April 2009). "Man Utd 2–2 FC Porto". BBC Sport. Retrieved 11 April 2009. ^ Wilson, Paul (11 April 2009). "Macheda's repeat performance puts United back on top". The Guardian. London. Retrieved 11 April 2009. ^ Hassan, Nabil (11 April 2009). "Sunderland 1–2 Man Utd". BBC Sport. Retrieved 11 April 2009. ^ McNulty, Phil (19 April 2009). "Man Utd 0–0 Everton (aet)". BBC Sport. Retrieved 20 April 2009. ^ Chowdhury, Saj (2 May 2009). "Middlesbrough 0–2 Man Utd". BBC Sport. Retrieved 3 May 2009. ^ a b Hibbs, Ben (17 May 2009). "Vidic does the double". Manchester United F.C. Retrieved 16 March 2016. ^ Lyon, Sam (23 September 2009). "Man Utd 1–0 Wolverhampton". BBC Sport. Retrieved 1 April 2010. ^ Stevenson, Jonathan (27 October 2009). "Barnsley 0–2 Man Utd". BBC Sport. Retrieved 1 April 2010. ^ McNulty, Phil (3 November 2009). "Man Utd 3–3 CSKA Moscow". BBC Sport. Retrieved 1 April 2010. ^ McNulty, Phil (25 November 2009). "Man Utd 0–1 Besiktas". BBC Sport. Retrieved 1 April 2010. ^ McNulty, Phil (1 December 2009). "Man Utd 2–0 Tottenham". BBC Sport. Retrieved 1 April 2010. ^ "Federico Macheda signs new Manchester United deal". BBC Sport. 2 December 2009. Retrieved 2 December 2009. ^ Bartram, Steve (21 January 2010). "Res: Sunderland 0 Utd 4". Manchester United F.C. Retrieved 16 March 2016. ^ Roopanarine, Les (27 March 2010). "Bolton 0–4 Man Utd". BBC Sport. Retrieved 1 April 2010. ^ "Relief as Wayne Rooney suffers 'minor' ligament damage". BBC Sport. 1 April 2010. Retrieved 1 April 2010. ^ McNulty, Phil (3 April 2010). "Man Utd 1–2 Chelsea". BBC Sport. Retrieved 3 April 2010. ^ Thompson, Gemma (28 July 2010). "MLS All-Stars 2 United 5". Manchester United F.C. Retrieved 16 March 2016. ^ Sanghera, Mandeep (13 November 2010). "Aston Villa 2–2 Man Utd". BBC Sport. Retrieved 13 November 2010. ^ "Ufficiale: dal Manchester United preso Federico Macheda" (in Italian). UC Sampdoria. 8 January 2011. Retrieved 16 March 2016. ^ "Macheda delighted with debut win". FIFA. 9 January 2011. Archived from the original on 12 November 2012. Retrieved 9 January 2011. ^ "Coppa Italia round-up". Sky Sports. 19 January 2011. Retrieved 20 January 2011. ^ Bargellini, Simone (10 May 2011). "Macheda could make Samp return". Sky Sports. Retrieved 27 February 2012. ^ Bargellini, Simone (21 July 2011). "No Italy return for Macheda". Sky Sports. Retrieved 27 February 2012. ^ Marshall, Adam (28 June 2011). "Lessons learnt for Kiko". Manchester United F.C. Retrieved 14 July 2011. ^ Coppack, Nick (13 July 2011). "NE Revolution 1 United 4". Manchester United F.C. Retrieved 14 July 2011. ^ "Macheda joins QPR on loan". Manchester United F.C. 2 January 2012. Retrieved 2 January 2012. ^ Sinnott, John (2 January 2012). "QPR 1–2 Norwich". BBC Sport. Retrieved 2 January 2012. ^ "Macheda returns to Man Utd". Premier League. 28 March 2012. Retrieved 28 March 2012. ^ "Macheda's injury blow". Manchester United F.C. 28 March 2012. Retrieved 28 March 2012. ^ Marshall, Adam (24 January 2013). "United agree Macheda deal". Manchester United F.C. Retrieved 24 January 2013. ^ "VfB swoop for Federico Macheda". VfB Stuttgart. 24 January 2013. Retrieved 24 January 2013. ^ "Thanks and all the best!". VfB Stuttgart. 18 May 2013. Archived from the original on 2 February 2014. Retrieved 19 May 2013. ^ "Manchester United: Federico Macheda joins Doncaster". BBC Sport. 16 September 2013. Retrieved 16 September 2013. ^ "Watford 2–1 Doncaster". BBC Sport. 17 September 2013. Retrieved 17 September 2013. ^ "Doncaster 2–2 Nottm Forest". BBC Sport. 21 September 2013. Retrieved 21 September 2013. ^ "Sheff Wed 0–1 Doncaster". BBC Sport. 28 September 2013. Retrieved 21 November 2013. ^ "Doncaster Rovers: Federico Macheda returns to Man Utd". BBC Sport. 8 October 2013. Retrieved 8 October 2013. ^ Froggatt, Mark (21 November 2013). "Macheda rejoins Doncaster". Manchester United F.C. Retrieved 21 November 2013. ^ "Macheda makes it a Red Devil hat-trick". Birmingham City F.C. 31 January 2014. Retrieved 31 January 2014. ^ "Birmingham 3–3 Derby". BBC Sport. 1 February 2014. Retrieved 2 February 2014. ^ Culley, Jon (12 March 2014). "Birmingham City 3 Burnley 3 match report: Federico Macheda double checks Burnley's charge". The Independent. London. Retrieved 13 March 2014. ^ "Birmingham: Squad stats: 2013/14". Soccerbase. Centurycomm. Retrieved 4 October 2018. ^ "Federico Macheda: Cardiff City sign striker after Man Utd release". BBC Sport. 27 May 2014. Retrieved 28 May 2014. ^ Phillips, Rob (26 August 2014). "Port Vale 2–3 Cardiff City". BBC Sport. Retrieved 26 August 2014. ^ "Brentford 1–2 Cardiff City". BBC Sport. 14 March 2015. Retrieved 29 July 2015. ^ Richardson, Nick (15 March 2016). "Reds complete Macheda loan". Nottingham Forest F.C. Retrieved 16 March 2016. ^ "Hull City 1–1 Nottingham Forest". BBC Sport. 15 March 2016. Retrieved 15 March 2016. ^ "Cardiff City: Federico Macheda and Adam le Fondre can leave – Trollope". BBC Sport. 25 July 2016. Retrieved 25 July 2016. ^ "Club statement: Federico Macheda". Cardiff City F.C. 30 August 2016. Retrieved 30 August 2016. ^ Murphy, Ronan (14 December 2016). "Former Manchester United wonderkid Macheda signs for Serie B side". Goal.com. Perform Group. Retrieved 14 December 2016. ^ "Ufficiale: In Azzurro L'attaccante Macheda" (in Italian). Novara Calcio. 14 December 2016. Retrieved 14 December 2016. ^ "Serie B. Gattuso, che blitz! Decollo Spal: è 2ª. E Macheda ha rotto il digiuno". La Gazzetta dello Sport (in Italian). Milan. 25 February 2017. Retrieved 25 February 2017. ^ "Fa doppietta dopo 6 anni. La rinascita di Macheda lancia Novara verso i playoff". Gazzamercato.it (in Italian). 17 April 2017. Retrieved 17 April 2017. ^ a b "Ex-Manchester United forward Federico Macheda joins Panathinaikos". ESPN. 3 September 2018. Retrieved 4 September 2018. ^ "Europeo. Inviata alla Uefa la lista dei 40: Esposito e Macheda le novità" (in Italian). Italian Football Federation. 15 May 2009. Retrieved 18 May 2009. ^ "Azzurrini sconfitti dalla Russia. Casiraghi: "Non si poteva pretendere di più"" [Azzurrini defeated by Russia. Casiraghi: "One could not expect more"] (in Italian). Italian Football Federation. 12 August 2009. Retrieved 18 August 2009. ^ "Reds around the world". Manchester United F.C. 18 November 2010. Retrieved 18 November 2010. ^ Vesty, Marc (8 February 2011). "Italy U21s 1–0 England U21s". BBC Sport. Retrieved 8 February 2011. ^ Marshall, Adam (25 March 2011). "Kiko and Welbeck on target". Manchester United F.C. Retrieved 25 March 2011. ^ Cantalupi, Stefano; Clari, Valerio (21 July 2009). "Next Generation: Macheda Un romano all'Old Trafford". La Gazzetta dello Sport (in Italian). Milan. Retrieved 25 February 2017. ^ Calfapietra, Alessio (27 October 2010). "I 100 migliori giovani secondo Don Balon". TuttoMercatoWeb.com (in Italian). Retrieved 25 February 2017. ^ Paul Howarth (29 November 2016). "Federico Macheda, Hasan Raza and the others that should send a warning to Haseeb Hameed not to burn out early". The Independent. Retrieved 25 February 2017. ^ Collett, Mike (5 April 2009). "Macheda makes his name with memorable debut". Reuters. Retrieved 25 February 2017. ^ Keller, Vanessa (3 January 2012). "Ferguson Remains True To His Word As United Begin January Business". International Business Times. New York City. Retrieved 25 February 2017. ^ Taylor, Louise (7 April 2009). "Macheda steps off the bench to follow in mentor Solskjaer's footsteps". The Guardian. London. Retrieved 10 April 2017. ^ "Robbers target Man Utd footballer". BBC News. 13 July 2009. Retrieved 13 July 2009. ^ "QPR boss Mark Hughes to look into Federico Macheda tweet". BBC Sport. 3 March 2012. Retrieved 5 March 2012. ^ "Games played by Federico Macheda in 2008/2009". Soccerbase. Centurycomm. Retrieved 4 October 2018. ^ "Games played by Federico Macheda in 2009/2010". Soccerbase. Centurycomm. Retrieved 4 October 2018. ^ "Games played by Federico Macheda in 2010/2011". Soccerbase. Centurycomm. Retrieved 4 October 2018. ^ a b "Games played by Federico Macheda in 2011/2012". Soccerbase. Centurycomm. Retrieved 4 October 2018. ^ "Games played by Federico Macheda in 2012/2013". Soccerbase. Centurycomm. Retrieved 4 October 2018. ^ a b c "Games played by Federico Macheda in 2013/2014". Soccerbase. Centurycomm. Retrieved 4 October 2018. ^ a b c d e "F. Macheda: Summary". Soccerway. Perform Group. Retrieved 16 December 2018. ^ "Games played by Federico Macheda in 2014/2015". Soccerbase. Centurycomm. Retrieved 4 October 2018. ^ a b "Games played by Federico Macheda in 2015/2016". Soccerbase. Centurycomm. Retrieved 4 October 2018. ^ "Games played by Federico Macheda in 2016/2017". Soccerbase. Centurycomm. Retrieved 4 October 2018. ^ "Chicharito scores on debut as Man Utd bounce All-Stars, 5–2". Major League Soccer. 28 July 2010. Archived from the original on 31 July 2010. Retrieved 28 July 2010. Wikimedia Commons has media related to Federico Macheda. This page was last edited on 14 April 2019, at 19:56 (UTC).